The Dice Tower Cruise started in 2016 as an idea between Tom Vasel and Jason Levine to bring the same Dice Tower board game convention experience to sea. 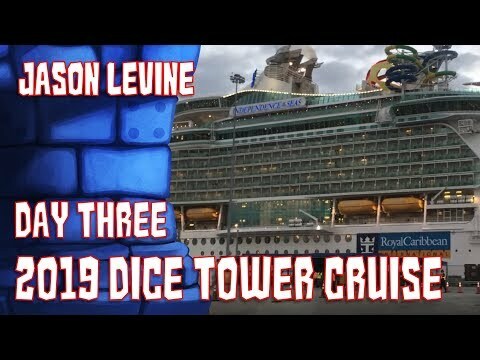 Using the same core values as The Dice Tower they strive to ensure that the cruise is a family friendly event and that everyone feels welcomed into our hobby. As the fastest growing board game convention at sea they will always make sure to create great value for all attendees. We will have many DICE TOWER personalities with us including your leaders: Tom Vasel and Jason Levine with more personalities to be announced. The following drinks are free at the buffets: water, iced tea, Powerade, milk, coffee, tea, orange juice, apple juice, prune juice (If you want soda, or something harder there are drink packages available at extra cost). 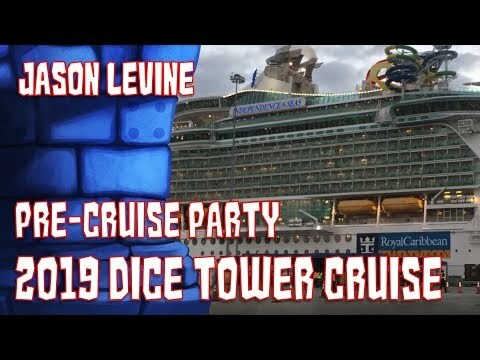 The Dice Tower library will be there. (Feel free to bring your own as well). Transfers from FLL are $15 each way. Operates from 10:30 AM – 1:00 PM on embark day. Latest flight arrival on embark day is 1:00 PM. Earliest flight departure on debark day is 11:30 AM. Transfers from MIA are $30 each way. Operates from 10:30 AM – 12:00 PM on embark day. Latest flight arrival on embark day is 12:00 PM. Earliest flight departure on debark day is 12:30 PM. These must be purchased directly through Royal Caribbean once you have a reservation number. You must purchase Fort Lauderdale transfers through us and can only do it after you supply your flight info. You can add your information here. We have a group rate of $160.00 per room for standard and $180.00 per room for jacuzzi, including all taxes and fees, for single or double occupancy for Thursday, January 23rd, 2020 which also includes access to our Pre-Party. On the return we also have a special group rate of $155.00/$175.00 per room if you plan to stay the night of Wednesday, January 29th, 2020. There are also day rooms available at a cost of $100.00 where you have a room for the day to shower and keep your luggage but cannot stay overnight. There is an additional charge of $20.00 for each additional person in a room, up to a maximum of 4 (four) guests per room for Queen rooms only. You must book your rooms through this website as you cannot call the Rodeway directly. For those arriving by plane at Fort Lauderdale Airport, after you have all your belongings, call the hotel to request the complimentary shuttle service which runs from 5:00 AM to 12:30 AM. 24 hours a day from open until Tuesday at 5 PM, as we need to pack it up.